I am living proof that brains shrink during pregnancy. Since my first days of queasiness some years ago I have been coaxing the wrinkly grey stuff to liven up a bit. I began gently, looking at pictures in Heat magazine. When the neurons started buzzing, I stepped up to photo captions in Hello, and soon I was reading whole advertisements in Vogue. And so on, until today when I find myself re-reading A. S. Byatt’s Possession, that thumping great, many-layered romance. 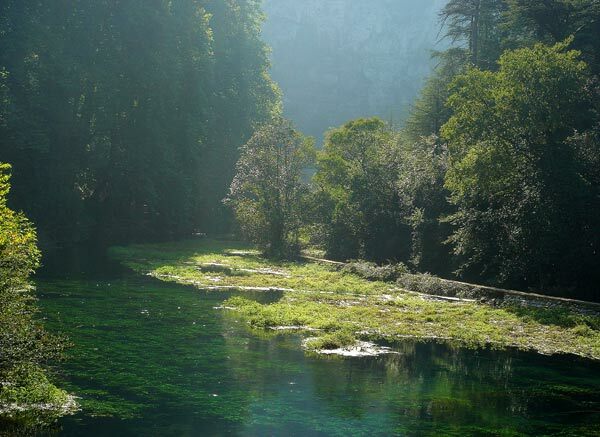 This describes the very source of the Sorgue river, where it sometimes shoots, sometimes flows imperceptibly, out of the ground at Fontaine de Vaucluse. This spot first attained literary prominence as the place where the 14th-century poet Petrarch mooned for 16-odd years after the lovely Laure, recently married to Hugues de Sade – ancestor of the dastardly Marquis de Sade. No doubt there is something extraordinary about Fontaine de Vaucluse; it is the place that lingers most in the hearts of all our visitors, and, it seems, Dame Byatt’s too. Child B refers to our most recent guest, Reg, as ‘that silly, silly man from the wooden airport’, which reflects both Reg's predilection for high jinks and his arrival at Avignon airport, using the new FlyBe service from, of all places, Southampton. He flew over, quite literally, for lunch, and so it seems right that I should shamelessly promote the new thrice-weekly service from Southampton and Exeter which makes such extravagant gestures possible. Anyway, I really can’t see why anyone would choose a big airport over a small provincial one, where you are free to swan about in white linen and floppy hats reenacting bits from Casablanca and can happily forget all about the existence of those nasty airport shopping villages. Not such a silly, silly man after all. In village shops across the Luberon you can pick up a photocopied leaflet; black and white and patterned with film reel. It’s the programme for a roaming cinema that comes to villages across the Luberon: Cinema La Strada. Wary of French films with subtitles, let alone those without, I went on my first outing to this ‘cinema itinérant’ this week. Monday is the turn of the Salle des Fêtes (‘village hall’) in Maubec and the film was Anna M. As we arrived, the local football team finished practice and their barbeque billowed delicious spicy smoke across the car park. The Luberon mountain loomed dark against an inky sky and the village of Maubec snuggled against it, drowsy and still. Inside we paid 5€ into a tin kitty and helped ourselves to tea. It’s free seating here, but there wasn’t exactly a scramble as we chose our hard plastic seats among four short rows lined up in front of the portable screen. Lights down and I forgot I wasn’t on a squishy velvet seat with on-tap popcorn and surround sound. I was hooked by the romance of this little cinema bringing its wondrous film reels to sleepy villages across the Luberon. And soon we were lost in film; a great French tradition. I reckon I qualify as a proper Francophile now, having watched a French film, in French, in France. Mind you, the plot of Anna M is not complicated and I think I got the gist: mad girl gets madder, madder still, has baby and feels better… or does she? Today I have a ‘belle angine’ (tonsillitis) and have taken eagerly to my bed in the belief that the Luberon must be one of the best places to languish ill, in a Proustian kind of way. Shutters that have folded protectively against heat and light for almost a century will do the same for me. Tiled floors are cool and sanitary. Maybe someone in the village will come running with an ancient Provencal remedy of crushed herbs. Maybe someone will fill my room with lilies to mask the stench of tonsil-breath. Maybe the doctor will pace the hallway with Husband, speaking in hushed tones. Or perhaps the children will jump all over the bed and bring me an assortment of trucks and plastic dinosaurs “to make you feel better, mummy” while setting off the samba version of jingle bells on an electronic keyboard. My prescription will yield four boxes from the world’s major drug companies and Husband will thunder up and down the stairs asking rather brusquely if I need more scrambled egg and tea.